Regardless of where you sit, the Internet of Things (IoT) starts and ends at the edge. There, sensor processing systems are responsible for gathering data about particular systems or the surrounding environment, transmitting that data over a wired or wireless connection for further data analysis in backend IT systems, and, often, leveraging that information in dynamic local decision making to drive pumps, valves, actuators, or other elements of a control system. However, systems at the edge are, and have always been, limited by the laws of physics. In the computing sense, these limitations manifest themselves in terms of size, power consumption, and cost, the three of which are combined to determine the viability of an IoT or embedded solution: Too large a form factor and you might size yourself out of target applications; A power draw that’s too high can mean the difference between servicing a battery-powered system every six months rather than six years; Too expensive and, well, you get the idea. The use cases diminish when any of these factors move in the wrong direction. In light of these obstacles, industry and academia have invested heavily in thin-film sensors and sensor tags over the past couple of years, the latter of which has a name that suggests the technology’s form factor-friendly packaging processes. Furthermore, these devices are designed to consume extremely low amounts of power that often can be harvested from ambient environmental sources, and produced at price points that permit their use in even disposable applications. Building from these developments, ON Semiconductor recently partnered with Austin-based chipmaker RFMicron on what the two are calling Smart Passive Sensors (SPS), a battery-less sensor technology implemented on RFID infrastructure. Built around the UHF RFID Magnus Sensor ICs, SPS products are able to not only communicate wirelessly, but also harvest energy needed to power the device from RF signals, making them 100 percent self-sufficient. The sensors are capable of detecting temperature, pressure, proximity, and moisture data that can be transmitted from the SPS to a processing platform through an antenna, with the sensors costing one-tenth of traditional solutions, it is said. 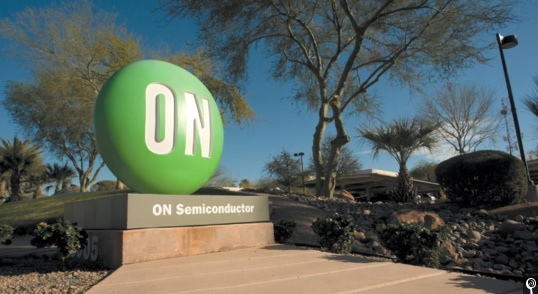 On the IoT Roadshow I met with Lon Robinson, Product Marketing Manager in the Sensors Division at ON Semiconductor, who walked me through a demonstration of SPS, using an antenna to set up a wireless communications link between the sensor and a Developers Kit equipped with an RFID reader. An LCD display on the Developers Kit displayed real-time measurements from the SPS, which were also communicated from the Kit to a website, which we monitored on a smartphone. Finally, a ZigBee link between the Developers Kit and a connected lightbulb that was configured to change color as temperature readings from the SPS changed. All of this was done with a single finger. Well, not really, but if you watch the demo below, you’ll see what I mean.